When performed correctly, seated leg extensions can really make the definition on the front of your thighs pop. Correct setup, controlled movement, and the right amount of weight are key to getting the greatest benefit while placing the least amount of stress on your knees. The muscles involved in leg extensions are your quadriceps group. Your quadriceps are a powerful group of four muscles that are also responsible for hip flexion. When seated, the hip flexors are neutralized and the quads work to straighten, or extend, your knee. The rectus femoris and vastus intermedialis run down the center of your thigh, the vastus lateralis runs along the outer portion, and the vastus medialis is toward the inner part of the quadriceps. During leg extensions, all four muscles work together to bring your knee from a bent angle to it's anatomical position. The vastus medialis is the second largest portion of the quadriceps muscles. While it appears to remain connected to the vastus lateralis throughout the length of the thigh, it actually bifurcates in the center at the appearance of another minor muscle. This means you can change your form during leg extensions, so the vastus medialis does the majority of the work. Rotate your hips so your toes point inward when you raise your legs. This creates a defined teardrop shape that tapers to a point at the inside of the thigh. To place greater emphasis on your vastus lateralis, rotate your hips outward so that your toes are pointing slightly to the outside as you raise the weight. This will develop definition and gain that rounded bulk of muscle above the knee that signifies superlative thighs. For better bilateral development, try working one leg at a time, so that your dominant leg does not do more work. Muscles work in groups to get the job done. While changing the angle of you lift can shift the load to emphasize the vastus medialis or lateralis, your rectus femoris and vastus intermedialis also participate. Using your leg muscles in ways that mimic functional daily activities is important for maintaining joint health and stability. The majority of your leg extensions should be performed with the hips in neutral alignment so that your toes are pointing toward the ceiling at the top of your lift. 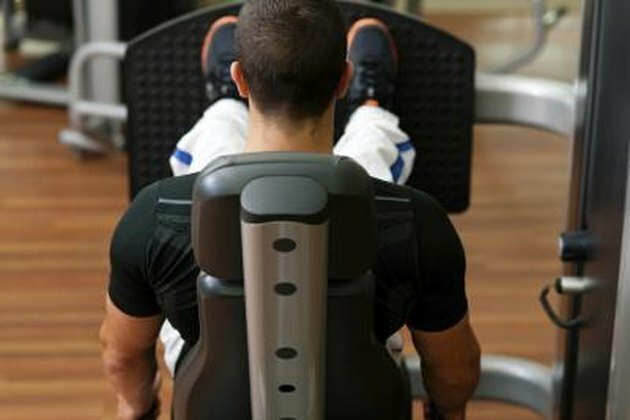 The upper and middle trapezius muscles act as stabilizer muscles when you perform leg extensions. The trapezius is a large triangular muscle group that starts at your neck and creates a cape-like cover over your upper and middle back before tapering down the spine. Stabilizer muscles do not move the way agonist and antagonist muscles do during exercise. Instead, they help the rest of the body to remain relaxed and absorb shock, so the primary muscles can do the necessary work to perform the action. The trapezius muscles stabilize your torso and hips so your thighs can lift and lower during leg extensions. Do Leg Presses Work Your Glutes?